Drew or Mina, does this also apply for Apinav shopi vs. Offeratory Alleluia "Al al-orban"? Can we say the offeratory alleluia on weedays during these 3 fasts mentions? What about Sundays during these fasts? I see no reason why Apinav shopi is limited to fasts or offeratory alleluia limited to feasts or non-fasts? Nothing theological about them that requires limiting them to such. One last thing. I have an old manuscript that says "Hymn" Taishori and the paralex is Tishori. So it is likely that they were both one hymn that was separated and randomly placed into weekday/weekend rites. In regards to Alle al korban vs Apinav shopi I truly believe the teaching that exists are pure opinions of modern cantors and not handed down. Alle al korban is the hymn of alleluia prior to the psalm that is said after the offertory and in my view fast or feast there is always a psalm so I see no reason why it cannot be said and I do say it. Apinav shopi is a hymn that in its most part asks for the prayers of saints and I fail to see why that should be reserved for fasts. I would of course like to read what others may say. In the very old days the inaudible prayers were respected as such, I guess to lead us to think about the secretive nature of the sacrament.. well by definition it is. Anyway, usually hymns were said in their entirety including ones like sotis, too, and although I'm not entirely sure about alle el qorban, or abenao but I would venture to say that because ajbeya prayers weren't considered majorsparts as RamezM told us before there wasn't something like keryalayson's 41 times, and in addition, priests would take a marvellous amount of time to pray, choose and bless and of course baptise the Offertory, a supporting hymn was added to alle el qorban. This is all based on nothing but deduction so I hope I'm not too far off. Remenkimi and Drew are absolutely correct. The restriction of Taishori/ Alleluia of the Offertory...Tishory/A pinav shopy to specific days and seasons is perhaps one of the most arbitrary, unnecessary ritual developments in our modern era. I will present only some of the sources that lead us to this conclusion, since I am unable at the moment to do an extensive research into this, not to mention that I only possess a small fraction of Coptic liturgical manuscripts, certainly not enough to say anything conclusive...so this may seem spotty. Even as late as the Gabriel V's 15th cent. Ritual Order (Al-Tarteb Al-Taqsi), we find him describing that the deacons sing Alleluia This is the Day while the priest is praying the prayer of preparation. No mention is made of A Pinav Shopi, and this is interesting as well because it tells us that indeed what we today call Alleluia Al-Qurban is nothing but the beginning of Alleluia Fai Pe Piehooou. I don't currently have Ibn Kabar or Ibn Sebaa in front of me, but I am almost certain they describe more or less the same rite. We can conclude then that at least in Cairo (the center of the Coptic patriarchate in the 14th and 15th cent, and the location where Patriarch Gabriel V and the presbyter Ibn Kabar served) Alleluia Al-Qurban was chanted from the beginning of the preparation of the altar for the Offertory (i.e. After the conclusion of Matins) until the priest has prepared the altar, prayed the mystical prayers, chosen the lamb, and was about to make the proclamation Glory and Honor. As Ophadece mentioned, this makes sense in light of the fact that until the early 20th century, the Agpeya was not a standard element of every Divine Liturgy as is the custom today. Where does that leave A Pinav Shopi? I don't recall seeing it in the three medieval ritual manuals (Ibn Kabar, Ibn Sebaa, and Gabriel V). Perhaps a more thorough manuscript study can reveal its history. However, looking at its very words, I suggest it may be a hymn to signal the beginning of the Liturgy of the Word rather than the beginning of the Offertory. "The time has come! Dismiss the multitude, let the teachers explain, let all wise men gather unto us to explain the holy books". It is generally agreed that the placing of the gifts on the altar (the latter part of the Offertory) was moved to its current location from after the Liturgy of the Word (Cf. Justin's Apology, among others). If that were indeed true, and I think it is, it would make sense that a hymn at the beginning of the Liturgy of the Word would be displaced somewhat earlier and fall in what is today the Offertory, when initially it would have signaled the beginning of the entire Divine Liturgy. This is the censer of pure gold bearing the aroma, in the hands of Aaron the priest, offering up incense on the altar. The golden censer is the Virgin, her aroma is our Savior. She gave birth to Him; He saved us and forgave us our sins. You are the golden censer, carrying the blessed and live coal. We worship Thee O Christ (notice how Christ is mentioned first since the entire focus is the incarnation) with Your good Father and the Holy Spirit for You have come and saved us. Very interesting points indeed. Thank you. Your comment that rites and organisations could be understood in the light of proper reading of the text, and linking readings together, so it makes sense. That only proves that with the decline of the coptic language many people raised the game with their innovations, and unfortunately this continues to happen for the continued lack of knowledge of cantors nowadays with the language first and second with the presence of manuscripts. Yes of course there's a strong verbal tradition but that's only supported by written evidence, not one without the other! 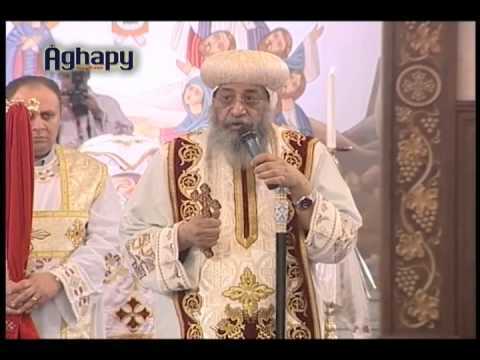 ramezm, finally i understand something someone says about coptic hymns! Abouna Athanasius el Makary present this when teaching the clergy and deacons about the rites. He has manuscripts to support that Tai Shori and Ti Shori are two verses of one hymn. There was never a weekday/weekend differentiation of them, they were supposed to be sung together. Yes, I was present at his public lecture at St. Maurice Church during the same visit, in which he gave an overview of his book on Great Lent, as well as the idea that Taishori and Tishori are a single hymn. However, I have not myself seen this manuscript, or heard this idea alluded to anywhere else. Also, one manuscript is never enough to make any definitive conclusions, especially that I don't recall the date or location of this source. Although the idea would make perfect sense, as I explained above, I have to remain hesitant somewhat to endorse this piece of information as a definitive fact until more work is done. Pray that someday our access to manuscripts (esp. those in Egyptian monasteries and libraries) will be made easier, which would allow us to discover, investigate, and write about our liturgical history (and more important, theology) much better than anyone has been able so far. I have a diyscanner. It's not as easy as it looks. The problem is not necessarily scanning. The problem is disseminating. As it stands now, there is some politics involved concerning who has access to manuscripts and what are they going to do with the facsimile photocopies. Any person can scan a manuscript. But it is best left for professional codicists and papyrologists. Then you have to factor in that there are many, many churches that have old manuscripts in private collections. If they are made public, they fall into the black market way too often. They are then broken up and sold page by page (The market value is literally $1000's of dollars per page for a Coptic manuscript). The best we can do is try to re-colliate manuscripts by buying them from the black market as much as possible. This is part of what St Shenouda the Archimandrite Society has done. There are now 190+ manuscripts and one of them is the one I described above with Taishori/Tishori in the same hymn. May God open the way for a fruitful and safe way to copy and study ancient Coptic manuscripts. There does need to be a serious digitization project for manuscripts. It would be a great service to offer some of these scanners for anyone who has these manuscripts. Rather than make them public, to scan them and keep the originals away from the public and away from the black market. As for those in the black market, let's hope they make it safely back in the right hands. Yes, but diyscanners (both the machine and the people scanning them) is not the way to seriously tackle a serious digitization project. It needs professionals and it needs resources at the university level with people who do this all the time. You wouldn't want a diy doctor doing surgery on you, or diy mechanic fixing your car. The ancient manuscripts are too valuable to have them digitized by the wrong people. What about the google scanners? From what I understand google is willing to copy just about anything you give it to copy in its database, and they have an extremely expensive scanner from what I gather. That assumes we will get all the manuscripts out of Egypt. If that happens, the Egyptian government (I believe) has the authority to claim anything that is over 100 years old as their own property. Of course, I doubt Google wants to send their $500,000+ scanners to Egypt. But it still doesn't change the fact, that scanning is only one part of the equation. Codicology and papryology is more than just copying and digitizing. Hi Remnkemi, was the DIYscanner easy to build? Could you share any 3d files (Step, CAD, Solidworks etc) or cnc router data that you might have? Concerning "non-professional" archiving of manuscripts, could not a crowd-sourcing model work in this case? ie. University Partnered a la [email protected] or BOINC? Of course such a model has to be adapted to factor in the manual process of physical capturing and then the sorting and indexing of images. Say every parish or monastery or independent researcher were to have one in Egypt and then the manuscript captures are sent to a university or a group of universities or say the Coptic museum, would that not mitigate the financial or funding constraints? "As for what belongs to the congregation and others, at the same time that after reading the servants' absolution, as in page 234, when the servant priest goes to raise the Pauline incense, the congregation sings this hymn for the Virgin - Tahashoria. "But if there wasn't enough time they say this (referring to dishoria). And this is also said specifically on the two Cross feasts, the ninth hour of the Great Friday, ordination of deacons, and weddings". That even means that tahashoria could be said on Saturdays and Sundays of Lent. This doesn't go hand in hand with the psalm sung after the baptism of the offering!!! I can also write down what he wrote about that, but perhaps not in this thread, as this one is for taha and di! I brought this discussion back just because i found out some new information about chanting tee shory and tai shory in weddings, only because it's wedding season (or atleast it was) and many are printing custom books with tai shory. Specifically for the Crowning Ceremony, I have always been a supporter for saying Tee shory and never changing it depending on the day. I realized that it doesn't make sense that the Hymn of the Virgin (The Censer) is to be changed according to the rite of the day, because if so, you would never get to say tee shory, because, and this is what I realized this past week, we do not perform any weddings on fasting day. The other thing that I found is saying tee shory in the crowning ceremony is attached to the Pauline reading, in a far fetched way. As we all know, there were really two separate services as part of the sacrament: 'aqd al-emlak and al ekleel. From looking at some older books, and even the recent prints of nahdit elkanayes khidmit shamas, there are two separate Pauline readings for each. And surprisingly, in one you say tee shory and in the other you say tai shory. Also in one you say pi-epnevma and in the other you say ni-khora after the pauline...but that's not our topic right now. Guess which hymn is attached to the current reading we say of the pauline (Ephesians, 5:22-6:3)?! :-)...it's tee shory. And that is actually the reading for the Crowning Ceremony in the old rite. So to me, it makes sense to stick to tee shory all the time. Any comments or opinions on what I just said? I know this probably has nothing to do with the topic of this thread, but can someone explain why they are saying Tai shori instead of teeshori on a great fast weekend day? I thought enthote was said on weekdays of Lent and Tishori on weekends. @mnhanna9 @minatasgeel We said tishori this year... when was TaiShori decided upon for Lenten weekends?? ?